Are you having trouble determining how to get started and what steps are necessary to turn your original concepts into reality? Our process will help you get to the point where you can "break ground" on your project. If you have a builder you wish to work with, they will most likely ask you to get some plans developed before they can give you reasonable cost estimates. We can provide these plans for you. If you have not made any contact with builders, we can provide you what is needed to get competitive bids from multiple contractors. A preliminary meeting will identify the objectives for this project. What functions do you wish to serve with the new space? What constraints exist with existing structure, lot, etc.? What is ballpark budget available for project? An estimate for design services will also be provided. Once we have met and gathered the information needed to proceed, including measurements of your existing home, we will develop a preliminary design. This will include floor plans and elevations. 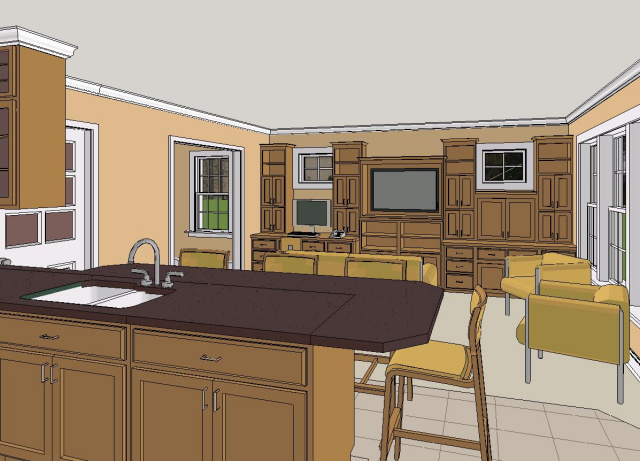 Also, the living spaces will be "filled out" with furniture, cabinets, and whatever else would normally be used. This will show you if proper space has been allocated for the functions your new space is intended to provide. We also can work with interior decorators where appropriate. This design will also address such things as integrating new roofs with existing and compliance with lot setbacks and codes. 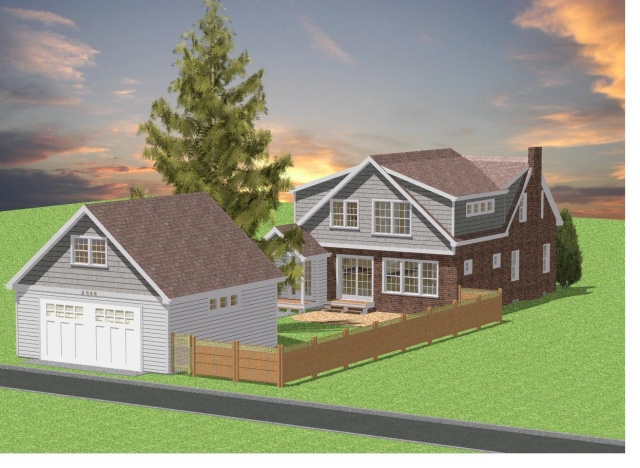 Included in this process will be renderings of the home that will help you visualize how the new design will look. In the case of additions, the new space will be shown as part of the total home to ensure integration with the existing home. Also, renderings of the interior such as new kitchen or family room can be provided to enable you to get a better feel for the new living spaces. Once the preliminary design is completed, we will walkthrough all aspects of the design with you. Often new ideas will emerge as a result of seeing the design and these can be incorporated into the design. This is an iterative process that continues until you are satisfied. Also, portions of the project can be identified as "options" or "phases" to allow the bidders to separate out costs. This can be helpful at keeping the project within the available budget. The results of the design walkthrough will be incorporated into the drawings. Other details needed by contractors and sub-contractors for estimating costs will also be included. Electronic and hard copy blueprints will be provided for the bidding process. During the bidding process we will be available to meet with or answer questions the contractor or sub-contractors might have about the design. We will proceed to complete all the drawings necessary for the project to proceed. All details needed for construction as well as permits will be produced. 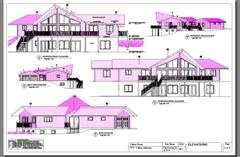 This would include fully dimensioned and annotated floor plans, elevations, section details and roof plans. 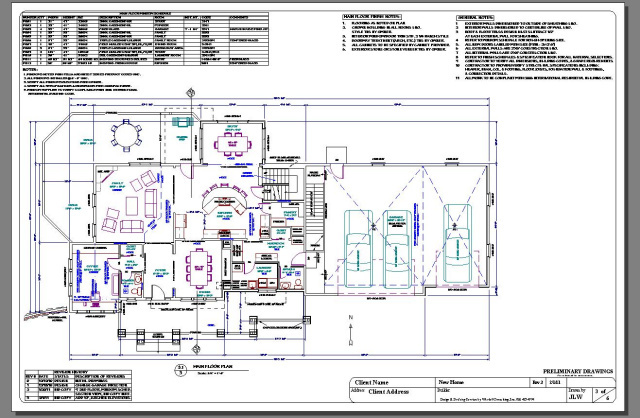 Also, if necessary, cabinet elevations, site plans and electrical plans can be produced. Once completed, we will provide copies to you and the builder for review. Then final sets of plans will be plotted and delivered to you and the builder. Electronic copies are also provided. 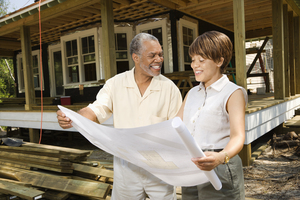 After your builder pulls the necessary permits you are ready to proceed to "break ground".